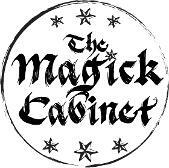 Welcome to The Magick Cabinet Metaphysical Properties of Crystals page. These are just the most basic spiritual properties of healing crystals. I encourage you to do your own personal research. I hope you will find, what is here, informative and enlightening. It will be a work in progress for a very long time. The Magick Cabinet has a wide variety of hand picked healing crystals for your spiritual needs in the Metaphysical shop. Agate: There are so many different types of agate I hesitate to lump them up in one little spot. So I will add them in by their names alphabetically. Amazonite: Called the “Stone of Courage”, filling the heart with determination, helping to bring about and sustain focus. Aids in overcoming negativity and self doubt. A stone of self-confidence, respect and grace. Enhance understanding and approve one’s ability to see another’s point of view. Allows one to be more cooperative with others as well. Amazonite balances the masculine and feminine energies of one’s personality. It enhances communications concerning love, as well as combating sexism on many levels. Known to enhance creative inspirations and endeavors. Amethyst: A stone of higher learning. Known as the "Change Stone" it holds transmutational energies assisting intense spiritual experiences. When you wear amethyst darkness and gloom disappear. Paired with rose quartz it is a comforting stone in times of hardships. Chevron Amethyst: also known as Dream Amethyst can amplify energies needed for manifestation and works well in grid work. Dissipates and repels negativity of all kinds. Enhances intuition and physical vision on all planes of existence. Chevron amethyst is said to bring courage and inner strength. Used to enhance peace of mind, relaxation and self-discovery. It is said it can deepen the meditative state, enhancing the quality of visions and inspiration from the higher realms. Amethyst Dodecahedron: To the ancient Greeks, the dodecahedron was a symbol of the universe. Its facets and symmetries compel our eyes and hearts to observe life more deeply. It’s believed the Dodecahedron represents an idealized form of Divine thought, will, or idea. To contemplate this symbol is to engage in meditation upon the Divine. A stone of higher learning. 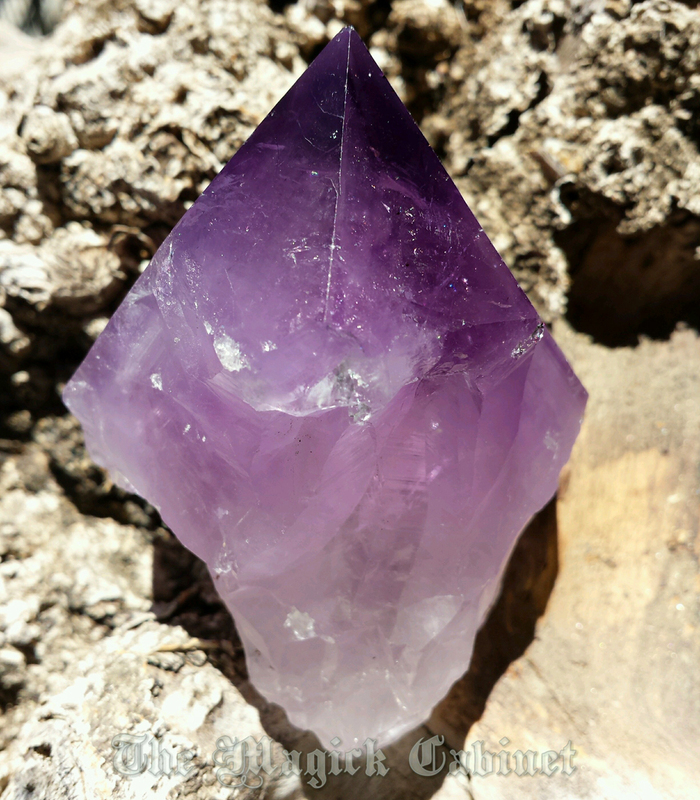 Amethyst holds transmutational energies assisting intense spiritual experiences. It promotes an understanding of the spiritual reality behind our lives. Ametrine: Ametrine energies are said to stimulate the intellect and rid the aura of negative energy. Helps one recognize the divinity within all, thus eliminating prejudice. Balance physical activities with spiritual, work with play. A stone of Joy. Ammonite: The "life Force" stone/fossil. The spiral shape symbolizes continual change and evolution. Ammonites have absorbed cosmic energy over eons of time and help to stimulate the life force-Chi- within. Amphibole Quartz: Provides a connection to the highest level of spiritual experience, calling your guardian angels, higher beings and spirit guides. Great for protecting against psychic attacks, as they fill in the weakest points. Gentle and calming energy. Triangulating 3 Amphibole Quartz provides a perfect meditation or creative space. Opens awareness to connect to your higher self. Attunes to the Universal mind, allowing a more detached perspective on life and evolution. Meditating on this stone lets you go to a place of deep universal love and peace. Andalusite: This "Seeing Stone" has the ability to help one see the true path one should be on. Will dispel the negative and change it into positive direction. Apatite: This is a "Muse Stone" - it will help you break through the creative block, enhancing your insight, imagination and creativity. Continued use of Apatite will increase your psychic abilities. Adding the stone to any others will strengthen the others stones properties. Aragonite: is an Earth Energy stone bringing a very grounding quality. Meditating with this stone can raise the overall vibration of the body. Helps heal past heartache and pain. Aragonite to help relieve stress and nervous problems. A strong stone of healing both emotionally and spiritually. The vibration of these stones gives you a strong sense of support and connection with the earth. Angel Aura Quartz: encourages natural intuition and insight. It is said to assist in the connection between the spiritual self and the astral planes. It is also said to provide a alignment to the stars, opening communications between the Earth plane and the angels and other spiritual guides. It helps raise the vibrations making connection with higher planes easier. Can be a bridge to channeling higher knowledge, remembering past lives and gaining insight into one’s spiritual mission in this lifetime. Sunset Aura: Raises the vibrational energy within yourself allowing for joy and self-confidence to flow. Use this stone in meditation to open and stimulate your Solar and Sacral Chakras so that it allows one to be creative and let inspiration flourish. Working with Sunset Aura can be very rewarding invoking love and peace, chasing away fear and uncertainty. The uplifting energy can show you the joy in everyday life allowing one to radiate positive energy out into the world. Titanium Aura Quartz: Titanium Aura quartz are excellent stones for use in Astral journeys and out of body experiences. A high vibration stone is helpful for removing energy blockages in the lower chakras allowing for creativity flow. This stone is said to open and empower all the chakras, stimulating the Kundalini energy. Titanium Aura is said to activate the Third Eye and assist with clairvoyance, readings and other psychic abilities. When used in meditation you will understand spiritual messages more deeply. Titanium Aura Kyanite: Excellent stones for use in Astral journeys and out of body experiences. A high vibration stone is helpful for removing energy blockages in the lower chakras allowing for creativity flow. This stone is said to open and empower all the chakras, stimulating the Kundalini energy. Titanium Aura is said to activate the Third Eye and assist with clairvoyance, readings and other psychic abilities. When used in meditation you will understand spiritual messages more deeply. Auralite-23: “A Stone of New Consciousness” because of it’s high frequency and abundance of metaphysical properties. A stone of balance and Blessings. Increased psychic abilities and sight. Can enhance communication with your higher Spirits. Helps us recognize the blessings in life and our relationship with the World. This stone also helps heal the soul through the remembrance of past lives and stimulating the insight needed to release karmic patterns. Aventurine: Stone of Self Reflection & Opportunity. It is told to relieve anxiety and calm one’s emotions, to bring about opportunity and to give good luck in games of chance. It is said to have the ability to enhance one’s sense of humor and cheerfulness as well. While it makes a powerful good luck piece to draw opportunities your way, it is told that it may also draw unexpected adventures as well as good luck in love. Apricot Botswana Agate: A stone of confidence, strength and nurturing. A gentle stone that instills a sense of protection, peace and calmness. This stone is helpful during pregnancies, as it thought to protect the baby in utero, and create a strong bond between the mother and her unborn child. Can assist in relieving distress when reacting to situations beyond ones control, by bolstering strength and inner fortitude. It balances Yin and Yang energy, allowing you to feel confident in your own power while remaining quietly firm in your personal space. Banded Agate: Protective from psychic vampires, restores bodily energy and eases stressful situations. Black Agate: Wear for courage and successful competitions. Sometimes confused with Onyx. A psychically protective stone that wards off negativity. Bloodstone: The "be present now" stone. Amplifies concentration, strengthens one's self-confidence and allows one to keep calm in stressful situations. Enhances intuition and creativity. Blue Lace Agate: Wear or carry this stone for peace and happiness. Place in your hand to de-stress the entire body. This is a calming, uplifting stone. The blue color strengthens the throat chakra, encouraging peace and communication. It also helps one to gently speak their mind and not be afraid to speak out. Blue Lace Agate will boost your ability to communicate, especially the thoughts and feelings that you receive from your higher self. Optical Yellow Calcite: It can't hold negative energy, rather, it transmutes it to positive. Yellow calcite helps you believe in yourself and recognize opportunities that come your way. Helps you alleviate negative feelings about yourself. It assists with channeling, intuitive awareness, shamanic work, and other psychic activities. It increases one's personal power, hope and sense of self-worth. It can help one organize intellectual thoughts and information. Very useful for meditation and focus. Celestite: Celestite is a popular stone for use in Angelic communications as well as with Higher Spirit Guides. Meditation with Celestite will open a clear channel of communication. Helping one acknowledge and accept that we are a part of the Divine Plan. It is also used in astral travel, assisting one in surrendering one to the inner peace and calm required for such journeys. Citrine: Helps you in letting go of your own negative thoughts and patterns. Also known as the "Merchants Stone" it can help bring in money for your business. ~ Citrine is a premier stone of manifestation, imagination, and personal will. A stone of the sun it brings warmth, comfort and energy. Awakens creativity and imagination. The Merchants Stone. Increases wealth and helps you to hang on to it. It can't hold negative energy, rather, it transmutes it to positive. It can be used in spells, healing or meditation to change negative energy into positive. Helps you alleviate negative feels about yourself. Is a bad habit breaker. If you have a bad habit you want to get rid of, wear Citrine to help. It not only attracts wealth, it helps one maintain it. Citrine is believed to enhance the intuition and the connection with the higher self. Citrine never needs clearing or cleansing. It's "self-cleaning". 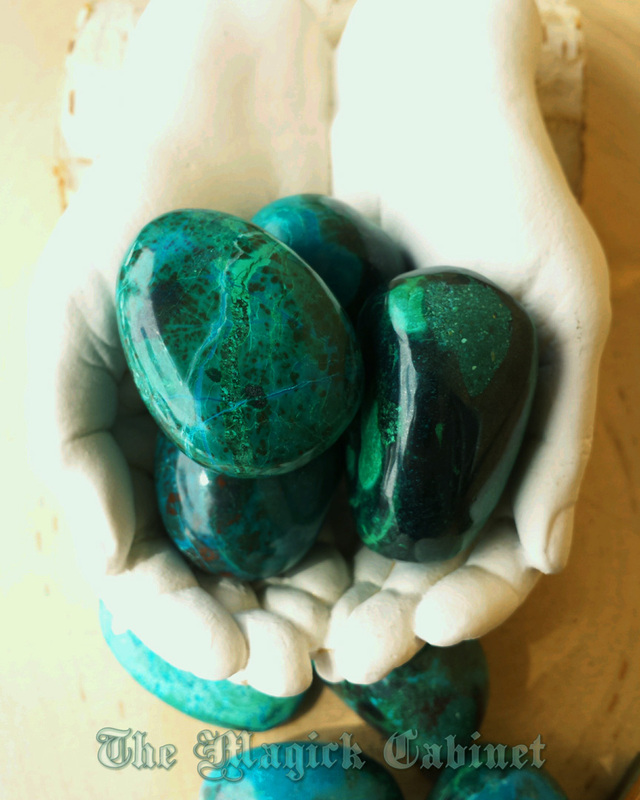 Chrysocolla: This stone is most generally associated with peace, tranquility, patience, and unconditional love. Said to offer gentle and soothing qualities, believed to improve intuition, and as a power source of life force energy. Told to be a stone of great feminine empowerment, assisting to build feminine energies, calm emotions, clearing the subconscious of guilt, fear, and tension. Chrysoprase: Enables one to welcome new situations. Induces deep meditative states. This stone has a strong energy vibration. Allows the resolve of past grievances. Heals feelings of separation and isolation. Enables reception of love and abundance. Assists with getting rid of bitterness, greed and selfishness. Provides steadfast resolve and compassion. Danburite: A very calming stone, bringing serenity and peace. Highly spiritual and sought after for its metaphysical properties, Danburite is a powerful Heart Chakra stone, relieving emotional pain and increasing acceptance of one’s self and of others. Highly spiritual stone and sought for its metaphysical properties. Danburite can ease stress and bring calm in difficult situations. It can aid in communication with Angels and Spirit Guides. Opens one to the Divine energies. Promotes restful sleep and lucid dreaming. High Vibration stone good for the heart chakra. Helps relieve stress and anxiety. Devic Temple Crystal - A Master Crystal that, if properly used, can provide a gateway through which Angelic beings, Divas, Spirit Guides and other beings of light can enter the physical plane. Inside this crystal are multiple rainbow inclusions of trapped air, water and gas that are called foils, veils and fairy frost. This stone looks as if there is a storm brewing inside of it. You can already see the rain starting to fall (a veil). It has a 4 sided soul mate on it's side and very tiny crystals growing around the sand silica on the bottom corner. The top golden brown part is sand silica as well with many triangular faces, doors and windows. Craters have formed on the outside where other crystals grew and fell off during it's long life. Dumortierite: is said to promote positive thinking in all stressful life situations. Provides one with courage and trust during times of hardship, helping you gain control and understanding. It has a wonderful ability to quell panic and fear, as well as clearing a scattered mind. This high vibrational stone has a great deal of positive energy. Enhances calm, introduces relaxation and a feeling of harmony. Emerald: Emerald, a stone of love and romance, will bring joy, enhance emotions, memory, faith and clairvoyance. It is said to benefit one’s intuition, promoting communication though honesty. Emerald is used to bring love into one’s life, used in magic to enhance psychic abilities, opening clairvoyance allowing stimulation of wisdom gathering from other planes. Epidote: Epidote can inject a sense of hopeful optimism into one's emotional body, helping to bring the mind into a higher vibration. It increases perception and interaction with spiritual beings, and brings spiritual growth. Fluorite aka Fluorspar: Stone of Discernment & Aptitude. Heightens intuitive powers and grounds spiritual energies. Used in healing rituals it can draw off negativity and anxiety. It can help you stay organized. Highly protective on a psychic level. It affects the intellectual mind, Fluorite quells strong emotions and soothes ones thoughts over the angry sea of depression and desperation. Fluorite is said to absorb and neutralize negative vibrations. It can be used as a meditation stone to help energize the body and raise the power of concentration. It encourages positive thoughts, balances the energies, and improves balance and coordination, both physically and mentally. Fuschite: is a mineral of rejuvenation and renewal. Especially helpful for those who need to keep schedules. 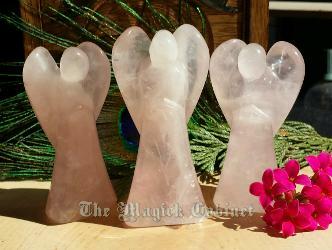 It is a good crystal for those who seek guidance from angels, faeries and other spirit guides. It shows you how to be of service, but not become a doormat. Releases blockages of excess energy, shifting it to positive channels. A stone with strong metaphysical properties that is very beneficial for everyone to have in their space. Because of it's luminescence qualities it makes a powerful gazing stone. A stone for drawing faeries. Use for any faerie magic. Garnet: A stone of love and commitment. Used in love spells and to enhance sexual desire. This stone makes you very attractive to other people by bringing out your best qualities. Girasol Opal Quartz: Stone of creativity, connection and inner knowledge. Activates third eye. A deeply spiritual stone. An excellent stone for visualization, imagination, dream work and guided direction of energy. Girasol enhances communication skills including freely speaking thoughts you’ve been holding back. A very ancient mineral found in Madagascar and has powerful energies. This stone can help you feel calm, relaxed, hopeful and optimistic. Herkimer Diamond: Perfect for deep spiritual meditations. Energizes, enlivens and promotes creativity. They stimulate conscious attunement to the highest spiritual levels. The “stone of attunement”. They can stimulate psychic abilities, clairvoyance, spiritual visions and telepathy. A energy generating stone that will enhance the power of any stone it comes in contact with. Psychic intuition will also be heightened with the use of this stone. It is the most powerful of the quartz crystals. Indigo Gabbro: This stone is beneficial for meditation and connecting to the spiritual realm. Indigo Gabbro jump-starts our spiritual journey and encourages us to grow into our most authentic self. It grounds our spiritual beliefs into practical actions, so that we truly live our beliefs, rather than just talking about them or vaguely aspiring to them. By carrying or using Gabbro you bring your emotions, mind and spiritual awareness back into alignment with each other. This calming, balancing stone will help you to focus your energies towards your goals. Pink Kunzite: Encourages you to open yourself up to unconditional, Universal and self love. This stone works very closely with the heart chakra. The vibration of Pink Kunzite will open the heart in many ways. This stones energy may help you understand that you are one with the Divine. When you become at one with the energy of Divine love, all other love in your life begins to change, as you resonate with the pure energy of the great Divine Spirit. Blue Kyanite: Kyanite is known to invoke tranquility and peace within, as well as intensify communication and psychic awareness. Great for cleaning auras and aligning chakras. Known to increase tranquility and calm within yourself and your space. Black Kyanite: Attunement, Meditation, Amplifier, Communication. Excellent for attunement and meditation. Great for cleaning auras and chakras. Stimulates psychic abilities while protecting beginners from the frightening aspects. Kyanite is known to induce tranquility and calm within yourself and your space. Said to be a stone of very high vibrations which promotes spiritual attunement. Meditating with Black Kyanite can help one see important insights resulting from exploration of the subconscious mind. It is often used to explore past lives and to anticipate how current actions affect our future lives. 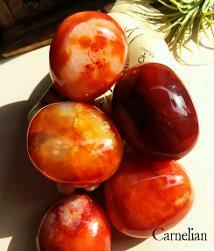 Carnelian: Stimulates creativity, strengthens concentration and courage. Adds zest to life and heightens sexual energies. Helps to break outdated and harmful habits. Dissipates tendencies to procrastinate. Is known to offer protection from black magic. Aids in overcoming negativity and self doubt. Can inspire you with gratitude for life and others. Ancient Egyptians carried it on and about their bodies as a source of constant renewal and vitality. In the Egyptian Book of the Dead that Carnelian was placed in tombs as “magic armor” for life after death. Dumortierite: Promotes positive thinking in all stressful life situations. Provides one with courage and trust during times of hardship, helping you gain control and understanding. Tumbled Dumortierite stones. You will receive 3 stones in a gift bag with a card describing their metaphysical properties. When it is carried, it has a wonderful ability to quell panic and fear, as well as clearing a scattered mind. Girasol Opal: Stone of creativity, connection and inner knowledge. Activates third eye and visioning. Astrological Sign: Taurus. Also known as Girasol Quartz and Moon Quartz, they have a translucent milky white, dreamy quality. Stone of creativity, connection and inner knowledge. Activates your third eye for stronger psychic abilities. A deeply spiritual stone, for visualization, imagination, dream work and guided direction of energy. Girasol enhances communication skills including freely speaking thoughts you’ve been holding back. A very ancient mineral found in Madagascar that has powerful metaphysical energies. This stone can help you feel calm, relaxed, hopeful and optimistic. Labradorite: Highly mystical and protective stone. Known as “The Bringer of Light” - It raises consciousness and connects with Universal Energies. Granting an inner knowing, enhancing intuition and psychic perception. Provides quick relief from anxiety, depression and hopelessness; replacing them with self-confidence, enthusiasm and inspiration. Lapis Lazuli: The energy of Lapis Lazuli is very high, and it does not lower its power to greet mere mortals, but rather, one must raise one’s power to match it’s. One must raise the mental, emotional, and spiritual energies to connect with the Lapis Lazuli. Larimar: The dolphin stone. Represents peace, clarity, healing, and love. It can bring one into a calm, relaxed state of mind. relieving fear, hurt, trauma, depression and pain; and assisting with one’s patience, acceptance, and simplicity. Lepidolite: is known as the Stone of Serenity because of it's calming and releasing energies. Assists in releasing internal stress and worry. Provides strength in times of difficulties. Clears environmental electromagnetic pollution. (Good to keep next to your computer!) Actively encourages self confidence. Awakens consciousness to the needs of the moment. Stabilizes mood swings and emotional balance. It is wonderful for dream work as well as dream recall. Malachite: the stone of gentle transformation. Used with caution, this transformation shall be strong, gentle and thoroughly cleansing. Malachite can help to manifest the goals that have been set. Energy amplifier and simultaneously grounds spiritual energy. Important protection stone that helps to absorb negative energy. Strong Earth energy. Has a strong affinity with nature. Brings balance and harmony if places on the heart chakra. Moldavite: The stone to cure the world. The first Moldavites were found in 1787 in Czechoslovakia, by the Moldau River. Very high vibrations. They are among the most powerful gemstones for spiritual development. They are used to raise vibrations and many can experience the "moldavite flush" when first working with the stone. It has an amazing ability to create much needed change in your life. It's a stone that can help you with your spiritual transformation and the universal connection. Moonstone: A stone of higher spiritual learning. Moonstone can bring love into one’s life, attract wealth, or help communicate with ones guides. Moonstone is a beautiful stone of mystery. It is a good crystal for those who seek guidance from angels, faeries and other spirit guides. A stone of new beginnings, with strong metaphysical properties that is very beneficial for everyone to have in their space. Encourages acceptance of your psychic gifts. A gem of the High Priestess. A stone of higher spiritual learning. Moonstone is a must have an any metaphysical collection. Golden Moonstone: with the fire of the sun and the power of the moon in one beautiful stone. Golden or Red Moonstone is a wonderful stone of powerful feminine energy. Radiating with a positive golden glow it is calming and brightening to the emotions, it helps to improve the user’s self-esteem. It reminds one of our own worth and divinity, and it invokes sensuality and gentle passion. The color reminds one of the enchanted feeling when the Full Moon is huge and low on the horizon emitting a reddish orange glow. Moonstone is receptive and love-drawing. This wonderful gemstone is also gently protective as well as receptive. Carry one with you daily for added strength and loving energies. Black Moonstone: The stone for easing the changes of life; knowing that when one phase ends the next is soon to begin. It is a stone of calm and relief from emotional stress. This crystal helps you to see clearly what you need to see in order to be able to make appropriate decisions. A perfect stone for New Moon Magic - bringing in something new or for forging a new path. Moss Agate: Wear to attract new friendships. Use in spells for money, long life and happiness. The Gardner's Stone. Has the energies to give anyone luck in growing plants. If you need a "green thumb" carry this with you while planting, put a few around the base of a plant in a pot to give it more energy to grow. Obsidian: Obsidian are wonderful scrying tools with their reflective beauty. Obsidian has been associated with guardian spirits for as far back as ancient lore provides. Said to watch over one, protect and connect to protection on all levels of spiritual experience. A very powerful psychic protection stone. It can also assist one with clearing negative energies, cleaning the subconscious of any blockages one may have. One of the best stones there is for a pendulum. It gives clearer messages than any other stone. Mahogany Obsidian: is often used to remove energy blockages and for cutting psychic cords, that sap one's inner strength. A perfect stone for dream work and going deeper into your subconscious mind. Obsidian aids divination, psychometric and psychic development pursuits. Red Obsidian is excellent for stabilizing and grounding light workers. Obsidian has been associated with guardian spirits for as far back as ancient lore provides. It is very useful against psychic attacks. 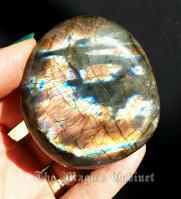 Rainbow Obsidian: has been associated with guardian spirits for as far back as ancient lore provides. After grounding, Obsidian then allows one to connect the mind and emotions. Obsidian pendulums are wonderful scrying tools with their reflective beauty, but are quite powerful. If using a Crystal pendulum and the results are not clear, attempt the same divination with an Obsidian. One should have better results. If it’s intense energy makes you uncomfortable, holding a clear Quartz in one hand while scrying should help balance the power. Often times the blackness of the stone will allow easier access to the subconscious. Said to watch over one, protect, and connect to protection on all levels of experience. Opalite: (Man made stone) Brings peace to all, it is a very beneficial stone to keep in areas where peace and serenity are needed. Can enhance psychic abilities and aid in inducing visions. It’s used for self exploration and reflection, is effective for use in dream work and opalite can aid in communicating with peaceful entities. Serene and soothing vibrational energy make it a must for your meditations. Petrified Wood: A stone that is excellent for grounding and stabilizing one’s emotions. Calming and offers a feeling of safety and security. Wonderfully protective stone. During a crisis, a piece of Petrified Wood can give one strength and support. Helps one to avoid mistakes and forget petty worries. Excellent stone for leaders as it has endured the ravages of time and become more beautiful and strong. Petrified wood can be used for past life regressions because of it’s inherent link with the past. It may be carried or utilized in spells designed to extend a life span or to increase our enjoyment, and evolution within our lives. Pietersite: It has also been called the "Tempest Stone". Giver of the "Keys to the Kingdom of Heaven", this stone quells negativity, calms the storm within and dispels chaos. Help's you follow your "true path". Polychrome Jasper: is a Seeker Transformer Stone. Seeker Transformers are talismans used when the desire is to find a way to transform a part of ones life to a more desirable state. This is a stone of Fire Energy -- the energy of heat, action, emotion and passion. A crystal of exuberance, spiritual energy, vitality, and vibrancy. All jasper's help balance the emotional energy in the body. Stone of Spiritual Metamorphosis: it holds transmutation energies allowing and assisting opening gateways into intense and transformational spiritual experiences. Helps to control negative thoughts as well as soothing anger and impatience. Prehnite: The stone of Divine Knowledge. Aiding in spiritual communication and awareness of Spirit through meditation and visualiation. It strengthens the life force and generally increases energy. Known for its ability to stimulate out of body travel and as a powerful dream stone. A stone of prophecy which stimulates inner knowing of oneself. Useful in psychic work, working within the astral realms and as exploring one’s past lives. Breaks down barriers in all planes allowing easy interpretation of the information that is presented. Pyrite: This unique metallic stone fosters intelligence, mental stability, logic and analytical thinking. Pyrite helps one to communicate more openly and honestly. Providing both emotional and physical protection. Carry a pyrite with you as a touchstone to help boost your self confidence. Rhodonite: (pink and black stone) Stone of Unconditional Love. Simply holding or carrying Rhodonite promotes calm and relaxation, bringing one a sense of well-being, allowing one to properly process chaotic situations and patiently assess one’s options before making a decision. Worn or carried to ward off negativity, to remain calm, cast off confusion and doubt as well as in-coherency. A wonderful stone for promoting self-confidence. Expressing confidence and loving emotions on a physical plane daily with those in one’s life. Rhodochrosite: (pink and white stone) The Power of Love stone. Radiating with compassion, selfless love and awareness. Will assist one in relaxing and de-stressing. Ruby: A powerful stone to shield against negative energy and psychic attack. As long as one carries a piece of Ruby wealth will never depart. Ruby in Zoisite: An energetic combination of stones which helps to reach and maintain deep meditative states, stimulating the mind and powerfully amplifying both mental and psychic talents. Ruby in Kyanite: Helps turn dreams into reality. A nurturing stone with healing and positive effects on the emotions. Shields from negative energy and helps us see the true nature of love and forgiveness. Helps to realign and balance the chakras. Can help you open up and receive Divine Love. Ruby in Quartz Matrix: A powerful heart healer. Helps to overcome heartbreak and balance your emotions. Activates and balances the heart and base chakras. This is a crystal of passion, wisdom and vitality. A highly spiritual stone raising your spiritual consciousness. Selenite: Heals negativity and fears. A stone of communication and higher learning. Bringing clarity of mind to your meditations. This stone makes it easier to communicate and understand your Spirit Guides. Bringing clarity of mind to your meditations. Keeps negative energy out. Excellent for keeping nightmares away. Place a pyramid on each side of your bed for restful sleep. Excellent stone for dream work. Desert Rose Selenite: Helps to reveal past lives and experiences. Known as the "Clarity Stone", it lets you see objectively with gentle vibrations. It connects you to your higher self. It helps you achieve intuitive clarity as well. Desert Roses are said to contain a spirit guardian, and each one is different. Because of this, they are useful as protective talismans and can increase your own self-confidence and self-worth. Septarian: Highly spiritual stone that aids in your spiritual growth and brings Illumination to your mind. Perfect to hold in your hand during times of stress. Encourages taking care of the Earth. Enhance the cohesiveness of a spiritual group. Can bring feelings of joy and spiritual uplifting. Focus and Clarity. Seraphinite (Serafina): So named for its connectivity to the highest choir of angels, Seraphinite (Clinochlore) offers some spiritually beneficial energies to all those who encounter it. Seraphinite is a stone of light energy, pulling higher vibrations into the subtle bodies, making it an important stone for those working on the ascension process. Seraphinite can infuse each of the chakras with divine energies. Seraphinite can be uplifting for those experiencing a reactionary depression. Working with Seraphinite during meditation can help those who lack purpose to discover their place in the universe. Shiva Lingam: Encourages you to see the uniqueness of yourself and to see that each of you are part of the whole. 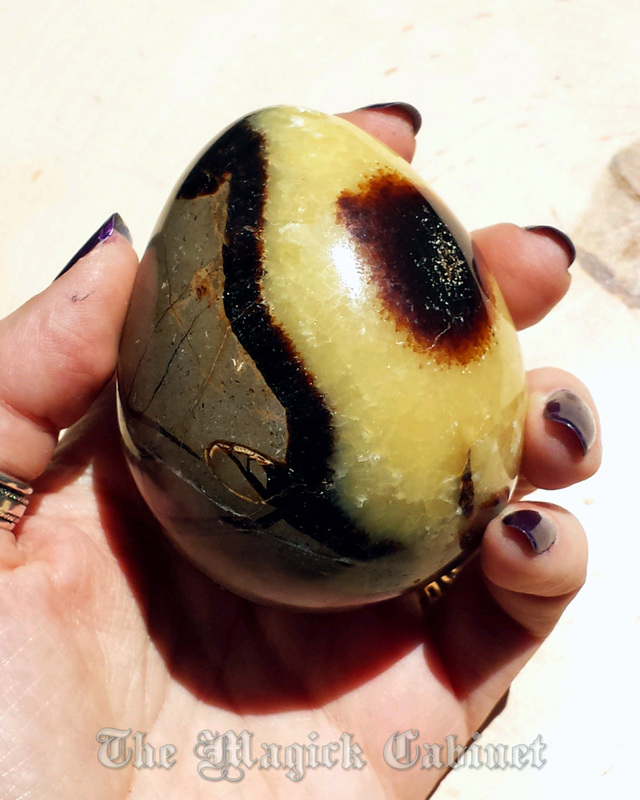 This stone embodies the feminine and masculine energies bringing them together as one as well as the cosmic egg from which all creation emerged. Use to: Charge the entire chakra system. Activate kundalini energies. Boost vitality. Enhance inner transformation. Break up old patterns and open the path for new life. Help to feel unity, even during times of separation. Scolecite: is a high vibration stone that promotes inner peace and opens the heart chakra. It infuses peace into the core of your being and connects you to the highest energies of the universe. Scolecite is calming and promotes love of one’s self and brings inner contentment. It can also assist in dissolving anxiety and fear, and instill a quiet confidence. Can also promote lucid dreaming and dream recall. Finally, it can help to restructure thought patterns toward positive outcomes while removing detrimental patterns and beliefs. Sodalite: Known as the Stone of the Mind, it can help you when you retain knowledge while you are studying. Sodalite clears the Third Eye enhancing psychic sight and encourages your natural abilities. Sodalite gives us a sense of calm to help us weather the storms of life. Raises the vibrations of your area and body to promote positive thoughts and solutions to problems. Tigers Eye: is a powerful stone that aids harmony and balance, and helps you to release fear and anxiety. Can be worn or carried as an amulet against curses or ill-wishing, and is known to give you courage, self confidence and strength of will. Also its energy has the ability to attract wealth, good luck, keep away evil, and protect one's family and friends. An important stone to keep with you at all times. Tourmaline: Stone of Complete Composure and Balance. All colors are said to enhance understanding, increase self-confidence and amplify psychic abilities. All colors hold the powers of Love, Friendship, Peace, Courage and can help with Astral Projection. Each color of tourmaline has it's own unique spiritual energies. Pink this stone has drawing energies of love and friendship, to be worn to promote sympathy towards others. Red (also called Rubellite) is worn to lend more energy to the body promote passion, courage and strengthen the will; it is also to be used in protection rituals. Green Use this stone to draw money and success in business, it is worn to stimulate one’s creativity. A muse stone for writers and artists alike. Blue this stone is best worn for peace and restful sleep as well as to de-stress. Very rare, if you find one grab it. Black this hue is used for grounding purposes and as to represent the earth in spells relating to that element. It is protective, and it absorbs negativity when charged for that purpose through visualization. Watermelon this gemstone is worn to balance the male and female energies within one’s body, it is also a love stone and works best for this purposed when used by one who is balanced. Rose Quartz: The love stone. Bringing vibrations of self love and forgiveness. A stone used in many love charm bags to bring a new love into your life. Rose Quartz can also support you in learning how to love yourself and how to receive love from someone else. One of the most popular healing crystals. Clear Quartz: The Stone of Power. The ultimate “anything-stone”, as it radiates all the color vibrations within the spectrum of light. A power stone that harmonizes and balances. It enhances energy and thoughts, and purifies the spiritual, mental, and physical. It is also a powerfully protective stone, bringing the purified energy in. Can be programmed to communicate with spirits and other worlds. Worn as a power amplifier during magic. The all-in-one metaphysical stone. One of the most popular and powerful stones in energy work. Used to cleanse, open, activate, and align all of the chakras. Clear Quartz can be programmed with intentions to emit helpful energies. Companion Quartz: Quartz crystals growing on the side of a larger crystal reminds you that you're not alone. Helps encourage friendship and mends broken ones. Chlorite Quartz: Chlorite Quartz is used for cleansing the aura, chakras, and energy meridians. Chlorite Quartz helps you emotionally and mentally accept your physical self as part of the spiritual flow of the whole. An extremely positive mineral that can help you visualize and create a more positive future, financially, emotionally, physically. Excellent meditation stone with gentle energies. Crystal Quartz with Chlorite is highly useful in healing, in meditation, and for spiritual growth and enlightenment. Quartz raises consciousness towards enlightenment and purifies on all levels. It can realign the energy into the ideal, acting as a bridge between spiritual and physical reality. A “stone of the mind”, Quartz can be used to imprint any energy or information, and help to focus the mind, aid in concentration, recall memories and enhance mental abilities. Use a Quartz Cluster with Chlorite Phantoms to foster peace, release tension, provide balance, harmony and to break up negative energy in the environment. Crater Quartz: are powerful in helping you overcome loss, grief and separation. It's called a crater when you can see where other crystals have grown and over the lifetime fallen off leaving a crater. Quartz Dodecahedron: To the ancient Greeks, the dodechahedron was a symbol of the universe. Its facets and symmetries compel our eyes and hearts to observe life more deeply. Some believe that the Dodecahedron represents an idealized form of Divine thought, will, or idea. To contemplate this symbol is to engage in meditation upon the Divine. Quartz are talismans used when the desire is to find a way to transform a part of one's life to a more desirable state. Great for manifestation grids, as they can amplify, tightly focus, and accelerate one's intention. Quartz are also believed to help remove attachments or unwanted spiritual patterns. The most versatile psychic stone among all crystals. Double Terminated Quartz: This stone can absorb, amplify and emit energy from both ends at the same time, making them a perfect stone for cleansing and balancing. Can be used to amplify energy and your intentions. Use during meditation for increasing telepathic abilities, enhancing psychic abilities, visualization or lucid dreaming. Elestial Quartz: Have an extremely high vibration and are powerful stones to aid your spiritual growth. They are attuned to the vibration of the higher spiritual realms and they will help you to make a stronger connection. These beautiful crystals are admirable crystals to have near you as they continuously bring in waves of pure spiritual energy. Hematite Quartz: maintains emotional balance during times of stress, and clear thinking. Quartz is perfect for healing and balancing. Cleanses and purifies the aura, chakras and other energy centers. Bringing positive vibrations. This crystal can stimulate inspiration and further your creative goals. Lemurian Quartz: Known for their innate metaphysical properties. They will assist all who are open to changing their energy, transforming first within, radiating out light, compassion, love, wisdom and grace. Record keepers of long-lost esoteric secrets of the Akashic records. Accessing the knowledge within those records takes a real connection with your Lemurian Quartz. Lemurian Quartz facilitates access to the Akashic Records. They can be used in meditation to transmit healing energy to large groups. Lemurian seed crystals are associated with the Protectors of the Earth. They give you a sense of oneness, of unity, of every individual part being equal and no better than any other part and the necessity for love in order to evolve. Rutilated Quartz: an energizing stone that helps get energy moving on all levels. Intuitive sources say that it assists with mental focus. It is also said to attract love and stabilize relationships. Rutilated quartz said to be particularly effective for getting things moving energetically. It can help slowed chakras return to normal spin and balance. Smoky Quartz: One of the most powerful psychic protection stones. Also very grounding for when you are meditating. Promotes positive thoughts. Aids concentration and assists in communication difficulties. Protects you from other's negativity. Opens the path for perception and learning. Promotes creativity in business. Promotes positive thoughts and personal pride and joy in living. Tangerine Quartz: A manifestation stone helping you invoke that which you want brought into your life. Carrying Tangerine Quartz can help you get past the apparent "chaos" of the world, releasing fear and generates a calm courage. Can help heal after a psychic attack. Helps to put things into perspective and brings a understanding of things happening in our lives. Its energy creates creative problem-solving skills. These crystals can raise your vibration to a more positive one, making interactions with others more productive. Time Link or Portal Quartz: the tiny, 6th face on a quartz that is a perfect triangle makes it a portal quartz. These can take you anywhere in your time you want to go. Use in deep meditations. Warrior or Emphatic Quartz: meaning it has sustained some damage through it's long life. They heal the hearts of those who have closed them while also protecting the open-hearted from too much pain.